A WEDDING WEBSITE: IS IT NECESSARY? Wedding websites have their purposes. It gives you the opportunity to share a little about your love story and provide valuable information to your family and friends about your wedding activities. Some people are on “team wedding website” from the beginning, while others are completely against it. I, personally, did have a wedding website, but I was a little reluctant, at first, mainly because I didn’t want to give away all my wedding details before the big day. But guess what? You have complete control over what to share on your website. You can share as much or as little information as you want, so don’t let this decision be the one that stresses you out. 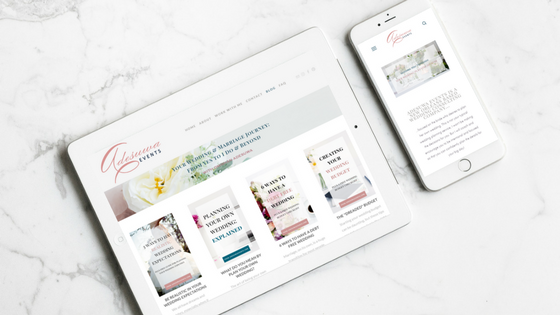 If you decide to include a wedding website in your engagement journey, or you’re still on the fence about it, I want to give you a few tips and details you may want to include. Remember, these are only suggestions. You can include them if you want or add to this list and include other specifics that may be related to your BIG DAY! As I mentioned, the purpose of your wedding website is to provide information about your wedding activities. In most cases, you won’t have all of details set in stone when you set up your site but having your URL (website address) in place sooner rather than later is a good idea. Once you have your date set and you are ready to send out your save-the-dates, you can include your wedding website address on your save-the-dates as the place to visit for the most up-to-date information. Once you have your site URL set up, you can start to think about what you want it to look like. Most sites, will have templates that you can use as a guide for the design of your site. You may want to include your wedding colors or your stationery font to help make your website flow with your other wedding details. Think of your wedding as a brand where all the elements go together. The look and feel should match the story of you and your fiancé’s relationship. Your family and friends may know how you and your fiancé met, but they may not know some of the fun facts about your love story. Your wedding website is a great place to share that with your loved ones. You don’t have to go into every single detail about your relationship, but you can give a few tidbits like the moment you knew he was the one, or how he proposed and what your reaction was when you said yes. Also, include some fun pictures of you and your fiancé. If you have taken engagement photos, your website is the perfect place to showcase them. The point here is to give a little context of your story to help build the excitement and joy of your wedding day. You could even tell your story in a “his (or her) version” and “her (or his) version” format to show your different personalities. 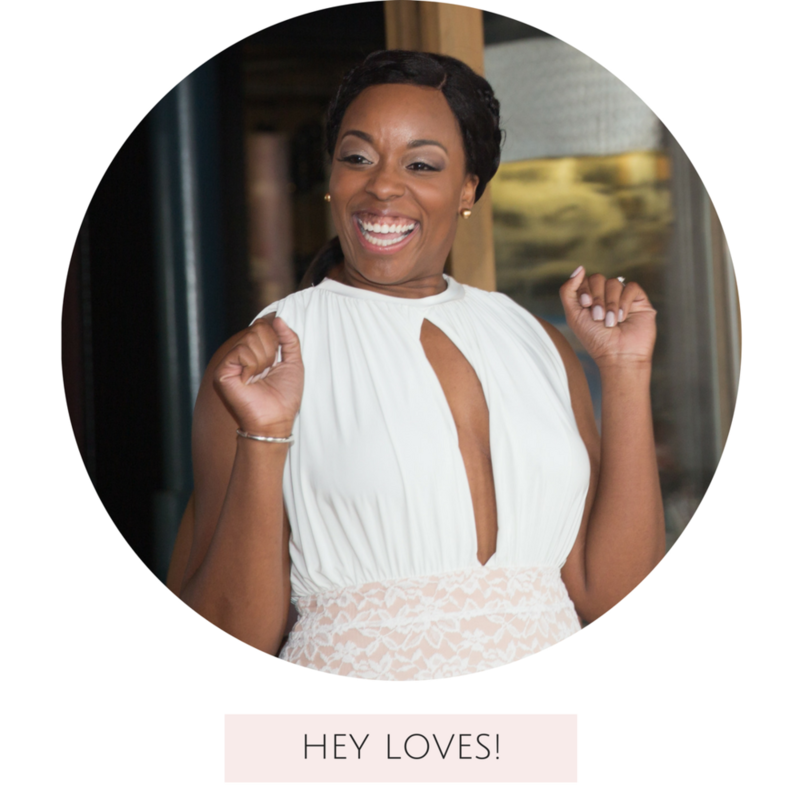 Some couples choose to introduce their bridal party on their wedding websites. You can have a picture with a brief description of the role that person plays in your life. This is a nice way to publicly express your gratitude to your bridal party for being a part of your special day. If you have made arrangements with hotels in the city you are getting married in, you can put that information on your website. You can include a picture of the hotel, the hotel’s website, directions from the airport, and the cost per night. Don’t forget to include any codes that your guests will need to receive your group rate. There may be situations where blocking out hotel rooms isn’t an option. If you’re in that camp, you can still include the names and websites of hotels that are near your wedding and reception venues. This will eliminate your guests needing to google “hotels in [enter your city here]” and having dozens of places to choose from. Another thing to remember, investigate what’s going on in the city where you are getting married. For instance, here in New Orleans, we have festivals all the time, but there are a few that attract visitors from all over the world. So, if you are getting married during one of those huge festivals, hotels would need to be booked at least 8 months in advance. Be sure to include that type of information on your site to urge your guests to book their rooms ASAP to avoid them from not being able to find a hotel. When you have out of town guests visiting your city for your wedding, they will sometimes try to make a mini vacation out of it. So, including a section of some fun things to do or places to see while in town will surely make your guests feel loved on. You can include kid friendly options for your guests that have children, museums and art galleries for your more cultured guests, or clubs and bars for your fun-loving friends who may want to get a little loose. On your site, you can include details about the attire you would prefer your guests to wear. You may already be thinking about including something like “Black Tie” or “Black Tie Optional” on your invitation, but I will be completely honest with you, a lot of people don’t know what those actually mean. So, on your website, you can explain exactly what your attire preferences are and even give examples so your guests don’t show up in mini skirts and shirts with no ties if you are wanting a more formal event. You can also include color preferences if you want your guests to dress in a certain color or if you are having a multicultural wedding and want your guests to dress in ethnic attire. You can get as detailed as you want here, even showing pictures to make things more clear. You want to take as much guess work out of it for your guests. And putting this information on your website gives your guests plenty time to make attire purchases, if necessary. Now, I was more of a traditionalist when it came to RSVP’s and preferred to receive my response cards via mail. But I know that more and more couples prefer to keep things as paperless as possible. So, if you prefer to track your RSVP’s online, you can include that information on your website. You can encourage your guests to give their attendance intentions here and avoid cards getting lost in the mail. It is considered poor etiquette to include your gift registry with your invitation suite. So, your wedding website is the perfect place to put links to the places you have registered. This will also encourage your guests to use your registry ahead of time discouraging them from bringing gifts to the wedding. If you are choosing not to register for gifts and would prefer to receive monetary gifts instead, you can also include a creative way to include that information as well. Although, I recommend you do have a gift registry of some sort because some people just prefer to purchase something over giving money. So, to avoid getting random things you may not want or need, set up a small registry with a few items that you actually want. If you are planning to have an “Adult Only” reception, your wedding website is a good place to detail that. Yes, you may want to include that on your invitation as well, but remember, your wedding website is the place where you can give more detailed information. You can share that children are welcome to the ceremony, but you would like to keep the reception children free. You can explain your reasoning if you want to, but it’s not necessary. Most people will understand and respect that decision without you going into detail. Deciding to have an adult only reception might deter some of your guests from attending your wedding because they don’t have a place for their children to go. Well, if this is a concern for you, you can arrange to have childcare provided for them during the time of your reception. If this is something you are considering, include that information on your wedding website to inform your loved ones with kiddos that you’ve got them covered. This applies to any size wedding, but especially if you are having a fairly large wedding (more than 150 people), I would avoid putting the exact location of your wedding on your website. You will most likely not be inviting every person you’ve ever known, and some of those people will find out that you are getting married. So, don’t set yourself up for wedding crashers because you put all of your wedding day specifics on your website. Any details of your BIG DAY that you want to be a surprise should be left off your website. You can tease to the surprise if you’d like, but don’t give it all away. For instance, if you’re planning for something special to occur at the end of your reception, like fireworks or a special send off, you can say something like, “we can’t wait for you to celebrate with us on our wedding day, from beginning to END 😉.” Tease them a little with something subtle for them to anticipate without giving away the surprise. Now, if after reading this post, you have decided to set up your wedding website, I have a treat for you. 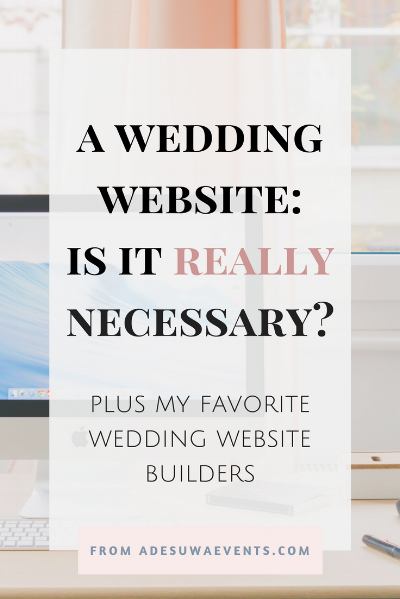 I’m giving you a list of my favorite sites where you can build your wedding website. I consent to marketing communications and the collection of my personal data from The Adesuwa Group, LLC as a result of submitting my name and email here. I understand I can withdraw my consent at any time and request the return of any personal data.